Summer or winter, salads add a note of garden freshness and an element of easy sophistication to mealtime. 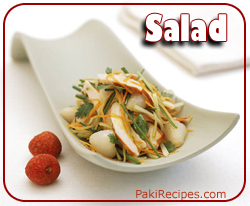 Salad now a days, has assumed a high priority as well as first place on the menu. We are still inclined to prefer it in its traditional location between main entrée and desert, mainly because a green salad makes a clean break between meat and sweet. 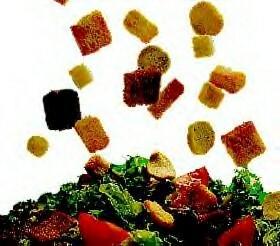 All salads were once light salads, edible part of various herbs and plants, seasoned solely with salt. They are also a mainstay of the dieters repertoire, providing lots of bulk and good flavors with very few calories. Instead of using fatty dressing, one can use sprinkle of lemon juice, a touch of spiced vinegar, or at most, a low calorie or fat free dressing. Salads mean all sorts of combinations of chilled fruits, vegetables, herbs, meat, cheese, fish - even pasta, cereals with some kind of dressing. Salad ingredients prepared long in advance suffer a loss of nutritive value, and arrive at the table looking disappointingly limp. Take care in washing, not to bruise them; see that they are well chilled, crisp and especially dry. it is usually to tear them rather than cut greens, except iceberg lettuce, which if you desire smaller pieces or cubes, can be sliced or shredded. To prepare lettuce, separate the leaves, wash them, thoroughly. Dry greens, by letting them drip in a colander, wrapping them lightly in a soft absorbent towel until dry. Use a spinner, if available. Some salads require time to marinate, others maybe served immediately. Unless indicated, salads are best served at room temperature. Mix together all the vegetables. Make a coarse paste of the coriander leaves and green chilies. Mix it with the vegetables. Add salt to taste. Prepare the seasoning and add to the vegetables. Add vinegar just before serving and mix together. In a salad bowl, whisk together the yogurt, sour cream, cumin, paprika, and garlic. Add cucumbers and tomato. Toss or chill before servings. Core tomatoes, and slice off tops. Scoop out most of the flesh and save for other uses. Season inside tomatoes well. Place shrimps, parsley, and celery in a bowl. Add mayonnaise and mustard; mix well. Season and add lemon juice to taste. Stuff tomatoes with shrimp salad. Place tomatoes on serving platter or dinner plates and surround with watercress. Drizzle vinaigrette over watercress and serve. Mix apples, pears, orange, grapes, pineapple, peaches and sugar together. Top fruit salad with non-dairy whipped topping then with sliced bananas. Serve Chilled. Place vinegar in bowl. Add salt and pepper. Add oil and which to incorporate. Add herbs if using and mix well. Correct seasoning and serve. Use this vinaigrette over green salads. Salads are a wonderful way to express your creativity. So use the recipes as your guide to a fresh look at salads. And enjoy!